"Supersizing the school is unneeded, unwise, and unsafe." My name is Dr. James Pekar. I am here as President of the Rock Creek Hills Citizens’ Association to ask you to vote against funding the addition - what MCPS calls a “cold dark shell” - because supersizing the new middle school to 1200 students is unneeded, unwise, and unsafe. It is unneeded, according to MCPS’s 2015 forecasts, which state that the new school would hold no more than 803 students through 2024. It is unwise, because the opening capacity of 949 students already exceeds recent guidance from the State of Maryland, calling for middle schools to be no larger than 900 students. The addition would push the total to 1200, far above the state recommendation. It is unsafe, because hazards identified by our County’s Planning Board remain unaddressed, as was recently noted in the letter to Mrs. O’Neill from County Planning Board Chair Mr. Anderson and Councilmember Rice. Over a one-hour period every school morning, over 800 vehicle trips (on top of high levels of commuter traffic) will access this school via narrow, hilly, curving, neighborhood streets. Restricted visibility for pedestrians and cars will increase accident risk for children accessing the site. A single steep driveway, plagued with blind spots and low visibility, must be shared by all student drop-offs, crosswalks, deliveries, parking, and emergency vehicles. Interactions between walkers and vehicles would inevitably create hazards. While many MCPS schools are embedded in neighborhoods, few, if any, have such a combination of traffic and site challenges, which would be exacerbated by expansion to 1200. For context, Rock Creek Hills Park is significantly reduced from the former site of Kensington Junior High School. After the old school was torn down, an elder-care facility was built on much of its footprint, taking a third of the land and a vehicle entrance. The remainder fails to meet almost all official County site standards, including size, topography, and access. Once built, this will be the only middle school with less than the new 15-acre requirement without an adjacent park to provide additional space. Due to this critical lack of space, this school will have no regulation soccer field, no large playing field, and just 2 of the 4 softball fields, 4 of the 6 tennis courts and 2 of the 3 basketball courts required by standards approved by the Board of Education. The soccer and softball fields are “overlaid” meaning just one athletic activity at a time. Classrooms are below standard size. If expanded to 1200 students, cafeteria and auditorium seating will be 25% undersized, necessitating “operational” solutions, such as staggering lunch throughout the day. 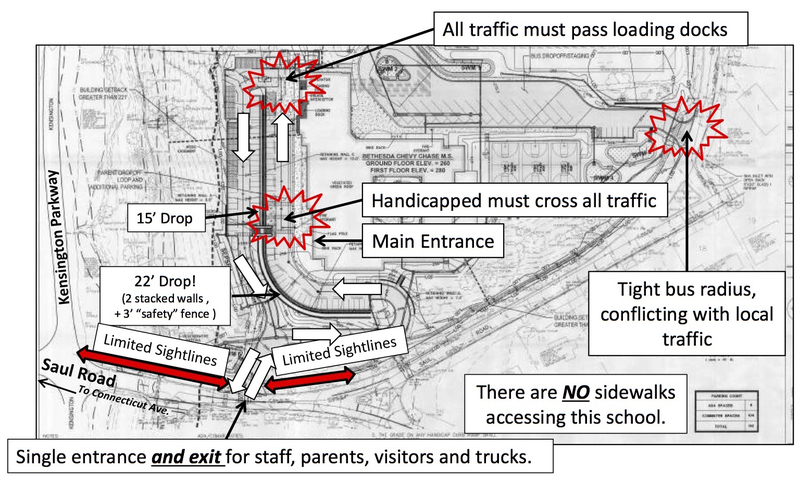 Despite additional costs for retaining walls up to 22 feet high to maximize useable space, the site will not have a separated student drop off, and, if expanded to 1200 students, would be short almost 25% of car and bus parking required by MCPS. So please, say no to this CIP amendment. Supersizing the school is unneeded, unwise, and unsafe. Instead, limit the size to 949 students, to improve outcomes, minimize harm, and, most importantly, protect children. Councilmember Elrich writes: "This is an expensive school with horrible access and the site work will cause irreparable environmental damage. ...this is absolutely the worst of all sites." I just wanted to appeal to you and your colleagues on the Board to not got through with the planned BCC middle school in Rock Creek Park. There is no doubt that we need a school, but there are better sites than this one. You’ve received no doubt countless emails on this subject and I believe that the opponents are really right. This is an expensive school with horrible access and the site work will cause irreparable environmental damage. It is not being built on the site of the former middle school, it’s being built on half the site since the other half is occupied by apartments now. You have a far superior option off of Jones Mill Rd that Park and Planning will actually accept it. The fact that P&P is willing to work with you to identify a suitable site is not something that should be ignored. You could reclaim the site in Kensington where HOC now resides. What you are doing here is expensive and unnecessary given that you have better options. It’s not too late to hit the pause button and reassess the alternatives. I had a chance to follow the scoring of the sites and I thought at the time that it made no sense and that from issues of access, the environment, the lack of flexible siting a reasonable capacity for growth, this is absolutely the worst of all sites. You will overwhelm both the site and the neighborhood. I have spoken to you and other Board members about this. We do not have money to burn, nor should we building new schools on constrained sites. I hope the Board can go back to the drawing board and come up with an alternative that is less costly and more respectful of the community and the environment. "...the process for the BCC Middle School didn't serve the public or our respective agencies very well and the final design is disappointing." The final design is disappointing. "MCPS’s application to use the General Permit for Stormwater Associated with Construction Activity for this project is clearly inappropriate, given the ... discharge of pollutants directly into Silver Creek, whose water quality is protected under ... the federal Clean Water Act." "The high quality of the riparian habitat along Silver Creek is seen in the high quality wildlife it supports: yellow crowned night heron, little green heron, great blue heron, wood duck, mallard duck, kingfisher, goldfinch, blue-gray gnat catcher, grackle, pileated woodpecker, downy woodpecker, hairy woodpecker, great horned owl, barred owl, red tailed hawk, red shouldered hawk, sharp shinned hawk, red fox, coyote, deer, raccoon, water snakes (Natrix spp. ), beaver, and even nesting snapping turtle." "... in response to Dr. Zuckerman’s letter to the community, a group of RCH parents has met with MCPS officials to address issues of pedestrian safety ..."
Today a crew from the Parks Department removed some swings from the playground in Rock Creek Hills Park, so that they can be re-used elsewhere. 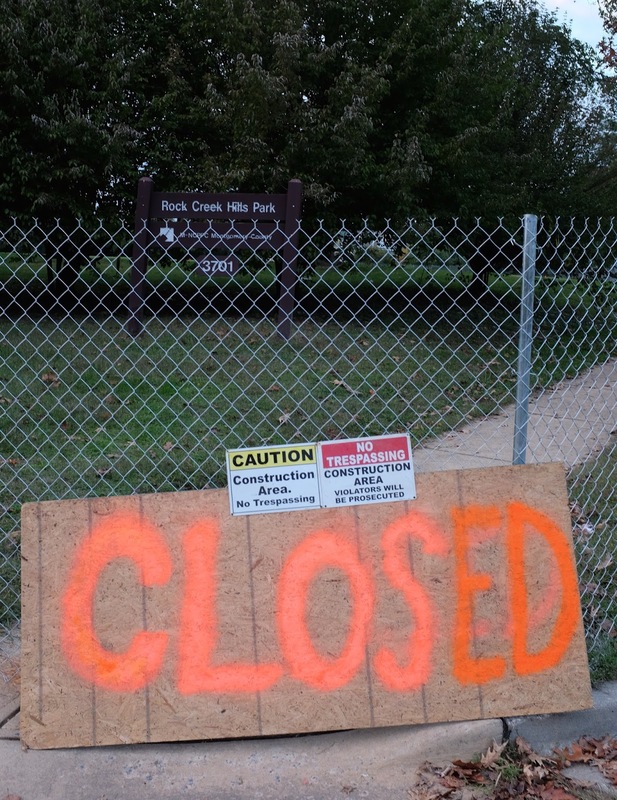 The park is slated to close permanently; groundbreaking for the new school is now scheduled for August 20th. As you may know, county Planning Board staff expressed concern about safety hazards in the site plan, and proposed a solution; we testified in support of their recommendation at the Mandatory Referral hearing in March (see postscript). Unfortunately, these efforts to improve safety have so far not resulted in substantive changes. 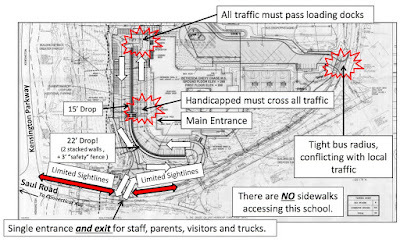 However, since the conclusion of litigation, in response to Dr. Zuckerman’s letter to the community, a group of RCH parents has met with MCPS officials to address issues of pedestrian safety and traffic planning/circulation; they are working with MCPS to explore options that would improve site and building functionality. "The district doesn’t have requirements for athletic spaces at middle school sites, [James Song, Director of Facilities Management] said." A group of residents said they are concerned that the site plan, as it stands, would limit athletic and academic spaces and pose safety hazards for drivers and pedestrians. The result, they said, is a school that would fall below the district’s project guidelines and would be unequal to other county schools, particularly Westland Middle School in the same cluster." – From the article "Community members seek changes to Kensington school plan" by Lindsay A. Powers in this week's Gazette newspaper. There's more, at "What Every Parent Needs to Know About the Proposed B-CC Middle School #2." "The Montgomery County Planning Board recently told the school system to revise its plan for the Kensington site to save more forest area overall and specifically some larger trees..."
Please, read the Gazette article by Lindsay A. Powers. - from the article "MCPS And Planners Sparring Over Design Of New Bethesda-Chevy Chase School" by Aaron Kraut on BethesdaNow. Building middle school on park site would be like "fitting ten pounds of sugar in a five-pound sack," says Shuman. "We're talking about trying to thread a needle here, and fitting ten pounds of sugar in a five-pound sack, with this project." -Mr. Richard (Craig) Shuman, Jr., Director, Division of Construction, Montgomery County Public Schools, at the 3/26/2015 Montgomery County Planning Board mandatory referral hearing for B-CC Middle School #2 on the site of Rock Creek Hills Park. "So please, uphold the law, adopt your staff recommendation. Save some trees, protect a creek, and most importantly, protect children." My name is Dr. James Pekar. I reside at 9723 Kingston Road, Kensington, directly across Saul Road from Rock Creek Hills Park. I serve as President of the Rock Creek Hills Citizens’ Association. I won’t need more than five minutes of your time, to testify in support of your staff recommendation. As you may know, we’ve worked to preserve Rock Creek Hills Park, because it is our neighborhood’s central green space, and because the site is obviously inappropriate and inadequate to the proposed school, and will yield a middle school that does not provide parity with others in the County. The park fails to meet the Board of Education’s official middle school site criteria for location, size, topography, and access. Indeed, the site fails to meet each element of the "access" criterion: Frontage on a primary (70’ right-of-way) road; three access points (for safety, to separate cars, buses, and trucks); community sidewalks. In light of the foregoing, I wish I could ask you tonight to recognize that, “If it does not fit, you must not permit!” – not because we disagree with your staff’s recommendation, but because the decision to build is wrong. We understand, however, that this hearing assumes that the school will be built on the site of the park, and seeks the best possible outcome. With that understanding, I am compelled to testify in support of your staff recommendation to uphold Maryland’s Forest Conservation Law by moving the car entrance up the hill, preserving a riparian forest stand. This doesn’t just save trees and protect the creek – it reduces retaining walls, reduces stormwater runoff, and improves pedestrian safety. It represents the safest, most balanced approach to the site. There are many reasons to support the recommendation of your staff (which is consistent with your staff memo from almost three decades ago). Let me mention just one. As noted in your staff’s transportation memorandum of February 27th (of this year), “…the relocated access point would have more than the minimum 200-foot sight distance required on secondary residential streets…” In contrast, the car access point proposed in the submission has intersections just 100 feet and 150 feet away (on either side), well within the 200 foot sight distance requirement, raising serious concerns about safety. So please, uphold the law, adopt your staff recommendation. Save some trees, protect a creek, and most importantly, protect children. Thank you.